Why Twelve Wild Horses wouldn't pull Alan Fearnley away from the romantic automotive nostalgia of the 1930’s. Do you see yourself as a storyteller of art Alan? Yes. I’m not interested in portraits of cars. I really like introducing people into my paintings rather than just mechanical objects. I like to do paintings which have some sort of a story and situation in them showing peoples facial expressions. I noticed that there are a lot people being active in your paintings. Do you have people posing for you? Sometimes I do. I’ve been involved in exhibiting in Monte Carlo for a long time. My first exhibition there was in 1988. Then I started exhibiting with Monte Carlo Fine Arts Gallery and because of that, I’ve done a lot of paintings, reconstructing the social scene. The imaginery world of the 1930’s. The glamorous cars, people and clothes, and all that gives a wealth of inspiration. I also do London scenes as well, rather than just motor racing scenes. It must be quite a challenge painting scenes from the '30’s when you were not there to witness it yourself? Well I use lots of references for the clothes and architecture for how it was back then but I have to be careful in my research in order to portray everything as it was. How do you research? Do you look at fashion books? Well I have a library with lots of books, photographs, magazines and many things I can refer to, although not too many fashion books. It’s more about getting the feeling of that time, rather than exacting every detail. I’ve got motorsport magazines dating back to 1949. For everything after the war, I have some sort of reference for it. How do you come up with the scenes. Do you make them up yourself? I usually make it up myself but sometimes people can be very specific in what they want. I had a Scottish client who had retired to Monte Carlo and he collected model T Fords. I did an imaginery painting for him of Casino Square, really in the very early years of the century where the buildings didn’t look at all like they look now. But I was able to get reference for them and actually his family, friends and other people all gathered together in Casino Square and with a couple of his model T Fords and a Cadillac which he had as well. Occasionally these things can get a little out of hand and become fairy-tale like. I try not to be too Walt Disney about it and get a sense of realism even though I am creating something from a hundred years or so ago. With an idea like that, do you already have that in your mind before you put it on canvas? No not really. It’s really a case of starting a sketch or layout and doodling away at it for quite often several days. Then an idea appears and develops and I introduce more elements until it has the look I want. Then I start work on the painting. Isn’t it difficult getting the lighting and reflections correct? Well yes but that’s the job of the artist. It’s what I do hopefully successfully most of the time. It’s always a challenge but it isn’t something you are aware of. As you start to paint, you paint whatever is necessary for the painting. A lot of your work has many romantic scenes with landscapes and picnics. Are you a romantic? I would like to think so, yes. I think we all have romantic memories of things. The motorcar has been an enormous influence in the past century. We have all taken our girlfriends out in our jalopies which broke down. All those sort of things and it’s nice to rekindle it in paintings. I notice you mostly paint Classic Cars. I do now. I used to paint a lot of F1 things but I can’t remember the last time I painted a modern F1 car. Although in actual fact, I have a commission for next year to paint a 1988 former Williams car. But these things come around very rarely and I really prefer cars of the 1930’s, 50’s and 60’s from a visual point of view. What do you think it is in particular that makes them different from the modern cars? Well the cars of the 1930’s are a lot more intricate. Once we got all the enveloping bodies in the late 40’s and 50’s, the visual interest in the car was lost to a certain extent. When cars have separate wings, headlines, running boards and louvres down the bonnets etc. there’s an enormous amount of visual interest in the car itself. As cars have developed, it’s disappeared and modern cars are totally bland. Some cars of the 1960’s like the E-type Jaguar are extremely difficult to paint because in a sense, the shape is too perfect. The curves are very subtle and to get the correct shape is far more difficult than painting a 1920’s Bentley, although there are lots of things on the Bentley to paint. That’s probably the best compliment you can give to the designers of the E-Type. Yes it’s just about perfect. While exhibiting in Monte Carlo, you must have seen a lot of races. Yes, I exhibited for 11 years at the Hotel de Paris to coincide with the F1 Grand Prix. I’m not too worried about watching the racing these days but I like to wander around the paddocks etc. I guess you must have been able to be in the pit stops close to the drivers then? Not actually during the F1 racing but a lot of the drivers used to come into the exhibitions, so I met lots of them. I knew Derek Bell very well because his agent was my agent. I also got friendly with Roy Salvadori as well. He was a very nice man. The guy who actually represented me there at Monaco Fine Arts was Michael Key and he was in fact a Lotus driver in the early 60’s. He drove along side Jim Clark. He unfortunately had a very bad accident which ended his driving career and he then became an art dealer and moved to Monaco. Do you get inspired by other artists? Not from motoring artists. There are other English artists who inspire me and a particular favourite of mine was called Monings who died in the 1950’s. He painted horses but certainly his style of painting influenced me a bit. Has there been a development in your own style and techniques through the years? Yes there has. 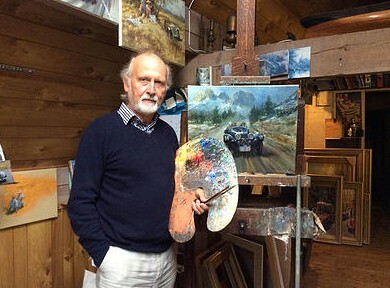 I started off painting impressionistic landscapes and motoring and railway subjects in the 70’s. Then in fact my style became tighter and tighter and more restricted as I started painting F1 cars. I think largely because of the advertising which has to go on the car. Now I find that my style has become loser again and I find myself moving back to a slightly more impressionistic and dashed off style of painting. The reason why I ask that question is because on your website you have your painting of ‘Twelve Wild Horses’ which is quite different. It’s a complete ‘one off’. I did some work for Chris Rea and he has a song called Daytona and in that song there is the line ’12 wild horses with silver chains’. I had the inspiration to do that painting for six or seven years before actually deciding to do it because it was so out of style with the sort of things I usually do. Anyway, I got down to it and am really pleased with it but it really is a one off. When I saw it, all sorts of questions came into my mind and I find it intriguing. Well as an artist, I just felt it was something I had to do. I don’t suppose I will do anything like that again though. Have you had an inspiration like that before, where you had to paint something? No not really. There are lots of paintings I want to do but nothing I felt I had to do in the same way. Are there any specific paintings which you would still like to do? I think I’ve done all the paintings I want to do. Occasionally I do get inspired to do a painting when I see elements which appeal to me or bring something to mind. How do you describe yourself? As an Automotive Artist or a Fine Artist? I usually describe myself as an Automotive Artist but only really to tell people the subject matter I usually paint, although I obviously paint other things as well. I was a member of the Guild of Aviation Artists and Chairman of the Guild of Railway Artists and have painted ships as well. I don’t look upon myself as soley an Automotive Artist. 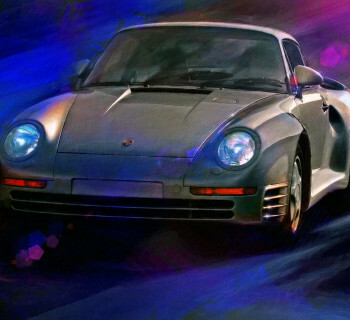 What I hear from a lot of Automotive Artists is that the subject matter limits them from getting more exposure. Yes, I think motoring art, along with railway and aviation painting doesn’t yet have the same recognition as for instance marine painting. I imagine that is really because motoring art hasn’t been around long enough in a sense. It’s not recognized as Fine Art in general art circles. Is that just a matter of time? It may be but it's taking an awful long time. 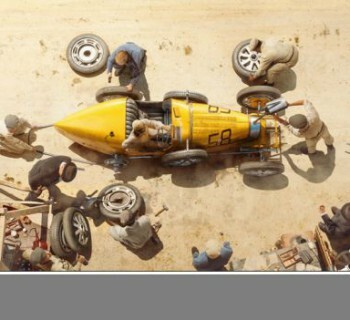 My view is that the automobile has had such an influence on our culture. Art is a way to capture the changes and moments in time and preserve them for the next generations. Yes I see it in exactly the same way myself but I think possibly that most motoring artists paint in a fairly strict representational way, whereas most art galleries and exhibitions are looking nowadays for far more modern, abstract work and not for pictures of something. In recent discussions with curators of car museums and from personal feedback on my social media, it seems that far more reactions are triggered by automotive paintings of nostalgia and memories rather than the super car. Do you recognize that? To a certain extent but I still think the car has to be special and something people dream about. What do you consider as the major quality in your artwork which made it so popular? I think it’s the ability to bring atmosphere of the time and place into my paintings. In your Mille Miglia painting, you have a wonderful scene of three supercars and big crowd which you captured brilliantly. Have you ever driven in a Mille Miglia? No I haven’t. I recently sold one of my cars which was a Lagonda but I still have my XK120 Jaguar and do some gentle rallying and outings in that which I enjoy greatly. Do you still have a dream to create your masterpiece or has that already happened? I really don’t know. Hopefully I might produce a masterpiece which is better than anything I’ve ever done before but I won’t know it, until I’ve done it. Do you see it as a challenge to do each painting better than the previous one? Yes I do really. I don’t chase work any longer but I receive a lot of commissions which I am very happy to do but I paint a lot more what I want to paint now. Even painting for an exhibition there is a tendency to paint picutres which will sell and with commission work, a lot of the decisions are made for me. So if I am not doing a commission, I like to do something which I really feel inspired about or haven’t done before or which I feel that I can make more of. I see the boundaries of a commission but I can also imagine that it challenges your creativity as an Artist to obbey the request of the customer while remaining creative and doing what you want to do as an Artist. That’s true yes. It is a challenge. The great thing about it is that most people who commission paintings are very happy to take the artists influence. Generally speaking, they employ me to produce a piece of artwork for them but there are obviously elements in the painting which has to be done. With a non commission, I feel more freedom to do what I want to do myself. For more of Alan Fearnleys work, please visit his website.